Through the use of short-run stampings & taking a few initial key steps, developing a part from drawing to delivery can be done in just 3-4 weeks. Although today's short-run stamping methods allow for design flexibility, reduced costs and quick turnaround times, thorough project preparation and due diligence are required on the customer's behalf to ensure your part is developed in 3-4 weeks. 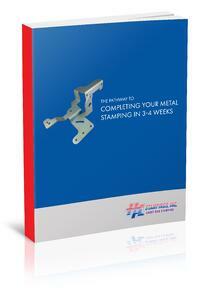 HPL Stampings' new eBook, The Pathway to Completing Your Metal Stamping in 3-4 Weeks, provides a detailed timeline and checklist to ensure all critical steps are taken in order to successfully move a metal stamped part from drawing to delivery in 3-4 weeks. Simply complete the form to the right to access this free eBook.